Cayman’s Cure for the Blizzard Blues | MGFD’s New All Day Menu & Happy Hour, Plus Indian Tuesdays Is Back, Now Monthly! Michael’s Genuine® Food & Drink Grand Cayman is cooking up a storm of new offerings for our island guests. 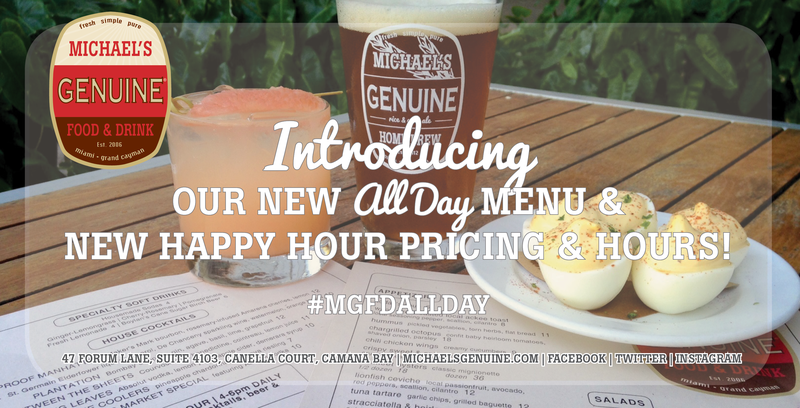 We are pleased to announce our new All Day menu is live, along with new Happy Hour pricing and hours. The new menu features the best of both lunch and dinner, and our Happy Hour will offer 25% off wine, beer & cocktails daily from 4:00pm – 6:00pm. Don’t forget we will still be serving our signature Sunday Brunch from 11:00am – 3:00pm! michaelsgenuine.com now reflects our updated hours of operation. In other amazing news, Chef Tony Rozario’s Indian Tuesdays are back! For $35 CI a person plus gratuity, dinner includes 3-courses served family-style and is now available on the first Tuesday of the month beginning February 3. Selections vary from butter chicken to lamb korma, and more. Here’s the first menu! Tony also shares the secret to pillowy naan bread and more as he leads a 2-hour Indian cooking class at Bon Vivant’s culinary showroom in our Camana Bay neighborhood. From basic building blocks, to the dishes they become at his monthly Indian Tuesdays meal, Chef Tony will present his students with the recipes for tandoori chicken, chicken tikka masala, butter chicken, and rice pilaf. No one will leave hungry! To book the Thursday, January 29 class, please contact Bon Vivant .